It’s time I wrote a blog as I’ve Been member for over a year. ” why do you wear all that colour?”, ” gosh your bright” and ” does the sweat not run your paint?” are among the most popular questions I get. I’m used to it now but as most of you know I am a chatterbox and I’m always talking even when running. 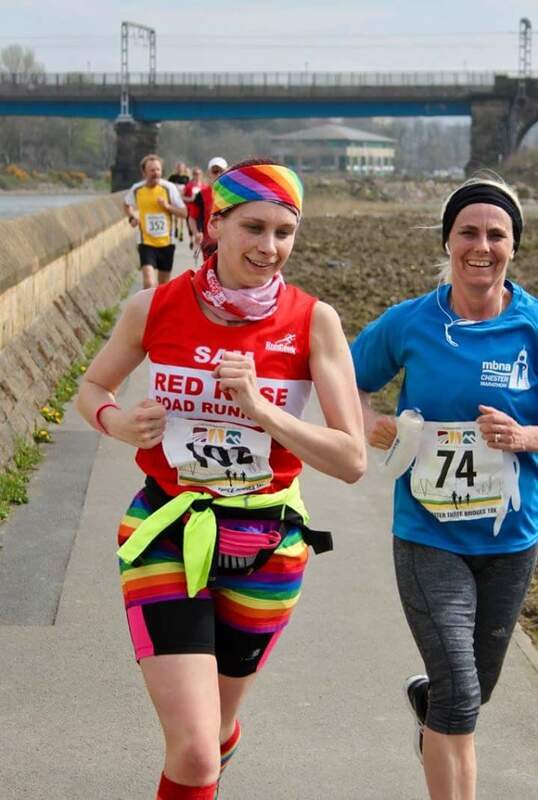 I’ve been a Red Roser for over a year now, the club is friendly, encouraging and running is so much fun. The best part was how everyone is accepted and everyone is able to join in not matter what your speed. Back when I joined I wasn’t as speedy as I am now and that’s thanks to the super support from everyone. 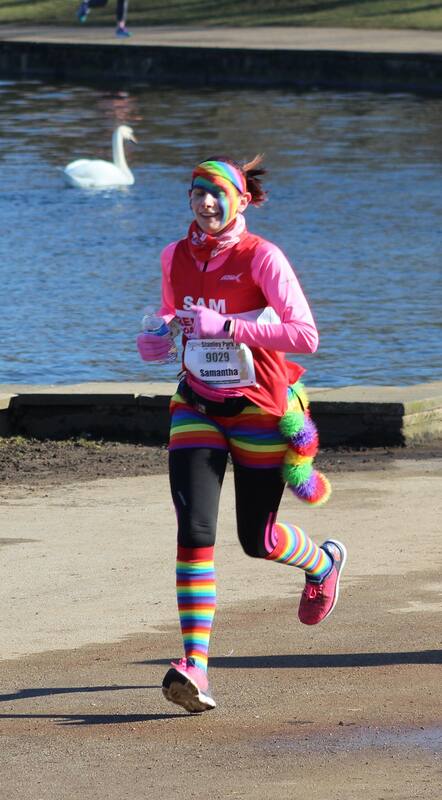 Back when I first joined I was known to blend in wearing NORMAL RUNNING Gear, which will be a shock. So my first run with Red Rose was at the poachers, where I stood there quiet, blending in with my normal running gear on and talking to a few people. I went out with the short group, a very cheery chappy called John was leading and off we went. As we ran, John was very funny, made me laugh and definitely made me think this is the club for me with his WEHAY and splashing into puddles. I went home and that night I joined. I went to more group runs, loving each one and getting to know everyone. Although I knew a few people already as they moved from Fylde Coast Runners to Red Rose so that was nice. 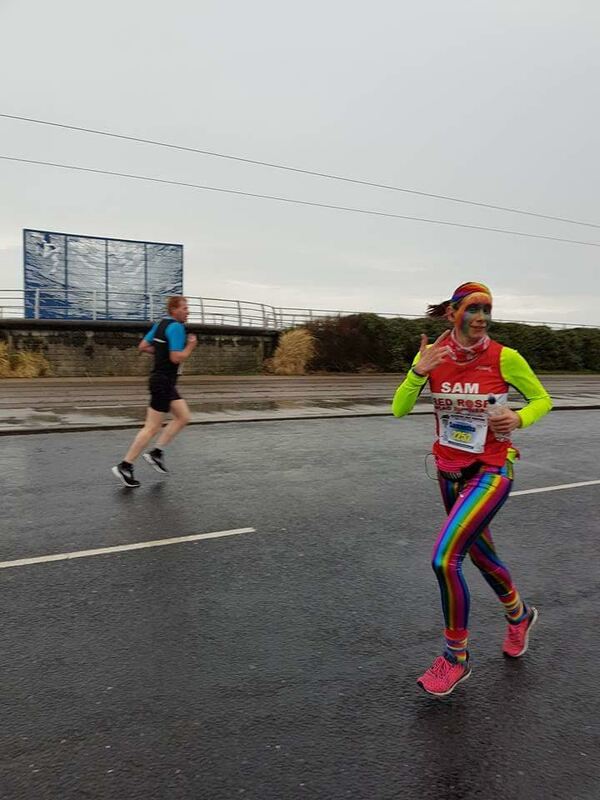 The day arrived, my first official run in a Red Rose vest, I was excited but I put normal shorts on, plus red and white stripey socks. It felt different but I had a go at looking normal. SHOCKING I KNOW. When I got to the inter club Ben said to me “This is not Sam”. I said “I know I miss my rainbows”. Sooooooo. Debating it on the next race day, rainbows or not rainbow, what will others think and then I thought, “you know what it’s me so it’s going on.” I’m glad I made that decision as I’ve never looked back. 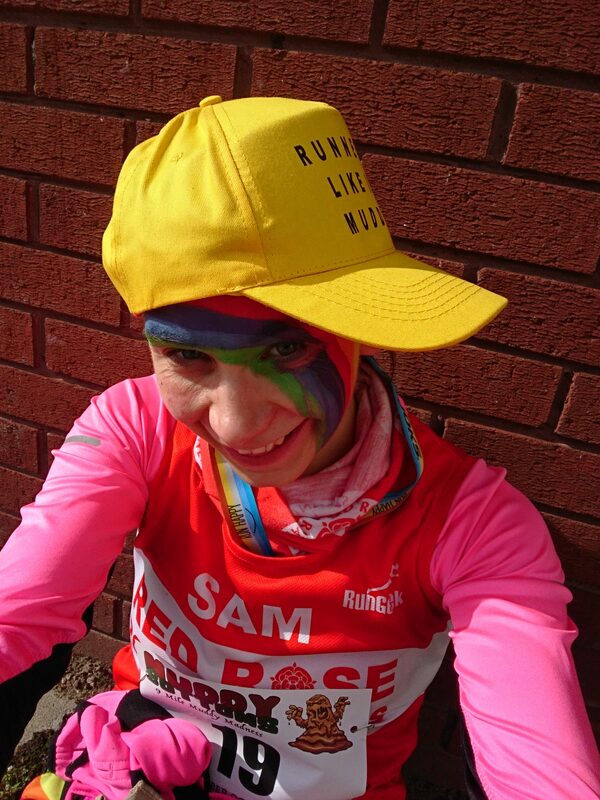 From then on if I turned up to a race without face paint or rainbow attire fellow Red Rosers were asking “Where are the rainbows Sam” so it became clear everyone likes my brightness, my rainbows and funky style. I can say Red Rose definitely welcomed the Rainbow. I also would like to say how nice it was to know I wasn’t told to not wear it or I cant wear it. This just shows what a friendly and fun club it is to be a member of. To new members you’ve chosen right because I rejoined this year and will be doing each year. I’ve made lots of great friends. So that’s me the Rainbow, the girl with all the colour who collects medals (the collection is at 140 plus now). So I’ve remembered I’ve not answered the one question you all want to know. “Why the Rainbows?”. Well I was thinking should I leave it a mystery or should I tell you. I will leave you with this answer. Because it’s fun, it’s good to be silly, you only live once and it’s great to spread smiles. Keep running and it takes less muscles to smile than it does to frown.